I am an M.S. student on the Marine Biology and Ecology track in the Coral Reef Ecology and Conservation curricular group. I am interested in using genomic tools to assess population structure and thermal tolerance in populations of Acropora cervicornis. I graduated from the University of Miami with a B.S. 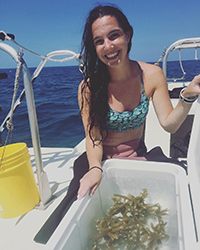 in Marine Science and Biology in 2016, and went on to work as a divemaster and environmental coordinator at South Beach Divers, organizing and running conservation-oriented dives, and as the outreach coordinator for the nonprofit Debris Free Oceans, organizing outreach and cleanup events and giving educational presentations. When Dr. Lirman and Dr. Baker received grant money for their coastal resiliency project in Spring of 2017, I was brought onto the project as a research assistant and field technician, and I transitioned into a graduate student on this project in January of 2018. On top of my lab work, field work and school work, I am also actively involved in Rescue a Reef outreach, helping to run our citizen science expeditions and teach student groups about coral conservation.